The award-winning ‘hop on, hop off’ Ring of Breadalbane Explorer bus is returning for the 2014 season, with routes commencing on the 1st June, running every Tuesday, Wednesday, and Sunday until 19th October 2014, and extending its timetable to include Saturdays during July and August. The Explorer service takes passengers through the stunning highland scenery of Breadalbane, passing through beautiful towns and villages and stopping at key visitor attractions along the route. 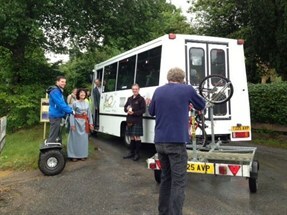 The service is also highly popular with local residents having a day out or as a public transport service.